Our application uses Norwegian language. 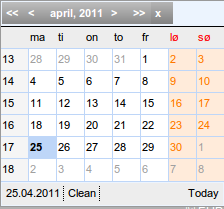 Locale parameter for rich:calendar translates months and week days OK,but doesn't translate words "Clean" and "Today". Is it possible to localize these words? usagi, can I add these properties to my .properties file in order to override richfaces ones? I can't,actually, find calendar.properties file in my project,looks like it hidden deep in lib. No, you woould not find this file, as it is not there. You have to create it, and place it in the org.richfaces.renderkit package, as RichFaces looks there for it. usagi, thank you for reply. How can I add the .properties file to richfaces-impl-3.3.2.SR1.jar? should I add it to classpath? Forget about the jar file. Just create the package and the calendar.properties file among your sources. usagi, many thanks to you!